One of the gifts I am giving this year is a Christmas wreath. I'm giving it to my lovely mother, who is coming up to my place for the holidays. who don't have anyone else to celebrate Christmas with. but I am welcoming everyone with open arms! and she saw my fall wreath, and loved it! so I knew she had to have one! Not only did I make one for her, but I made one for myself, as well. 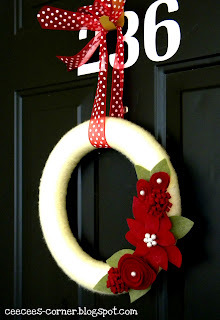 I used cream Vanna White yarn to wrap around a styrofoam wreath. I had no clue that Vanna White had her own yarn collection! But I loved working with it. and I can totally tell the difference. 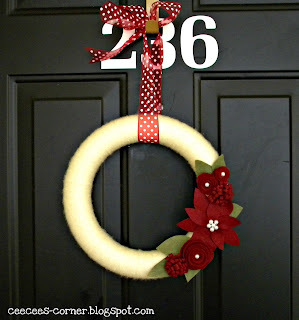 If you're going to make your own yarn wreath, spend the extra $2.00 and go with Vanna's yarn. 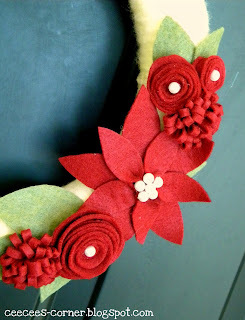 I found a great tutorial for the wreath wrapping and poinsettia here. and for the roses, you can find the tutorial here. Um, yeah I'm sure she will LOVE it! So pretty!